Dentist in Pittsburg, KS | Not sure how it happened! Not sure how it happened! Posted March 13, 2010 . As I became more proficient, I obtained my license, and started going on longer and longer rides. Those of you with a bike know what happens next. You buy a nice bike, then realize shortly after getting it that your new friend has suddenly gone from your dream bike to your “starter” bike. That has happened to me. Today my son, Brandon, and I drove over to Joplin to check out the Harley’s at CycleConnections. Never having researched Harley-Davidsons before, I considered this trip a scouting expedition. We arrived and casually looked around the showroom. I had heard about “Fatboys”, “Softtails” and “RoadKing Classics”, but had minimal knowledge about the specifics. My new friend, Martin, at the dealership was patient with me as I asked questions, looked at the different bikes and just small talked. 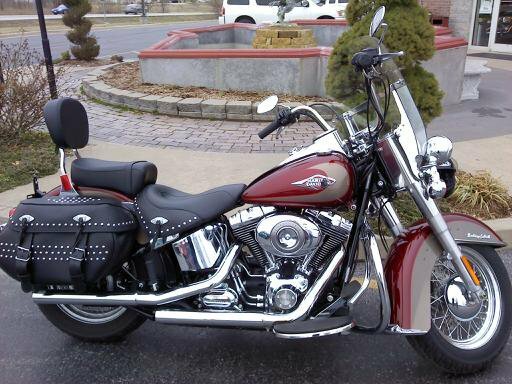 Soon, I was eyeing the “Heritage Softtail” for the first time. I circled her a few times, afraid to touch her. I did not want to cheat on my Honda, afterall. Then it happened. The invitation to sit on her. I reluctantly gave in to the invitation. WOW!! As awesome as she looked, it was her throaty roar that really caught my attention! Before I knew what I was doing, I was signing a release and was on the open road for a test ride. The air temperature was cool, but I was so warm all over as we headed south out of Joplin to the winding roads and hilly stretches. The only explanation was her siren call (“potato potato potato”) had blocked out all feelings of coolness in the air. It was the best!! There is nothing like the first time–on a Harley!! Now that this has happened, I will have to act “normal” around my Honda. Then the hard part, convincing my wife that the Honda was a “starter” and that I “need” a new bike. That will probably be for another post!! I will let you know how this all pans out! Until then, keep it real!! !